Benefits of Kinesiology Tape, Kinesiology Taping - General | by Tape Expert | Comments Off on Kinesiology Tape – What Makes it Different? It’s almost impossible to watch a sporting event these days without seeing one or more athletes wearing brightly colored strips of tape in interesting patterns on knees, shoulders, elbows and more. This special tape is called kinesiology tape and it appears to have all but replaced the traditional white sports tape that athletes have relied on for years. If you haven’t tried it yet, you’re probably wondering what is it about kinesiology tape that has made it so popular and what makes it different from other types of athletic tape. While most types of athletic tape have little or no stretch, kinesiology tape is very elastic, able to stretch longitudinally up to 60%. Both the thickness of the tape and its elasticity are similar to that of human skin. When non-elastic sports tape is applied to an injury, the rigidity of the tape restricts or prevents movement of the taped area. This is desirable for severe injuries where immobilization is necessary to prevent further damage. Most injuries, however, do not require full immobilization and this is where kinesiology tape shines. Applied with varying degrees of stretch, k-tape can provide support to injured muscles and joints while still allowing a safe and pain-free range of motion. This allows athletes to continue to train and compete as they recover from minor to moderate injuries. Because the tightness of traditional athletic tape can compromise circulation, it must be cut off immediately after activity. Kinesiology tape, on the other hand, can be worn for several days, providing support and therapeutic benefits 24/7, the entire time it is worn. Kinesiology tape has a unique acrylic-based adhesive that is latex-free and hypoallergenic. In addition, the adhesive is not solid, but is applied to the back of the tape in a wavelike pattern that creates alternating area of adhesive and no adhesive. The acrylic adhesive is much gentler on skin than conventional tape and seldom causes skin irritation or breakdown. It does not require the use of a protective prewrap to prevent skin damage, and can be applied directly to unbroken skin on any part of the body. The wave pattern allows moisture to flow easily from the taped area and the cotton fabric dries quickly, allowing physio tape to be worn comfortably through swimming, showering or sweating. A quick pat with a dry towel and it’s back to its original state with no residual moisture to irritate skin or lead to bacterial growth. 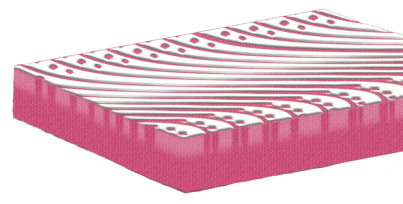 Even more importantly, the alternating ridges of adhesive create a pressure differential in the tissues under the tape, allowing it to interact with pain receptors, blood vessels and the lymphatic system to relieve pain and inflammation. The greatest differences between kinesiology tape and other sport tapes can be seen in the method of application. While traditional sports tape is typically wrapped tightly around an injured area, kinesiology tape is applied over and around the borders of muscles and joints. The amount of stretch in the tape can vary, depending of the purpose of the application. to provide support for weak or injured muscles without affecting the normal range of motion. This allows full participation in therapeutic exercises and/or sports training, minimizing the risk of developing compensatory imbalances or injuries. Kinesiology tape is a remarkable therapeutic modality that can benefit a wide variety of sports injuries and health conditions. It is inexpensive and relatively easy to use. Even individuals with no medical background can easily learn basic application techniques for many physical issues. While it does not replace rigid taping methods such as the McConnell Taping Technique, it expands the role of athletic taping from simply preventing further injury through immobilization to becoming a true therapeutic modality that assists in healing and recovery.